Joseph, Mary and Jesus lived in Nazareth. Each year, Joseph took his family to Jerusalem for the feast of Passover, it was a long journey. They would travel with other people. On their journey, they would meet people going to Jerusalem. They would all travel together. With all of these people traveling together, this made a caravan. One time, when Jesus was 12 years old, they went to Jerusalem for the feast of Passover. After the days of Passover in Jerusalem were over, they were getting ready to return home. With all the people trying to get ready to leave, it was confusion and the hustle and bustle… people talking… children running. Mary and Joseph looked for Jesus. They asked people if they had seen him. The people said that he was playing with the other children. Joseph and Mary joined the caravan. They left Jerusalem. After a day’s journey, they still couldn’t find Jesus. Mary and Joseph then left the caravan and returned to Jerusalem. They looked for Jesus. Mary and Joseph were so worried. Where could Jesus be? Then on the third day, they went to the temple. Jesus returned with them to Nazareth. He never caused them one more worry. Mary and Joseph did not understand the meaning of the words Jesus had spoken to them in the temple. Mary thought of them often. She treasured every word Jesus spoke in her heart. These strangers learned about the God of the Israelites, but they never worshiped God at the temple in Jerusalem. Instead, they built a temple in their country and worshiped there. They became bitter enemies of the Jews, and at the time of Jesus they were still despised by the Jews. In going to or returning from Jerusalem, the Jews of Galilee usually would not take the shorter road, through Samaria, but would travel the long road, which led first to and across the Jordan River, then along the border of the land where the people lived whom they despised. Because Jesus wished to take the shorter road, through Samaria, his disciples were willing to go that way too, in order to be with him. So they journeyed together as far as a little city called Sychar. Near the city was a wayside well, which had been dug hundreds of years before probably by Jacob, the grandson of Abraham. And in honor of him it was still called Jacob’s well. When they reached this well, Jesus was tired, and sat down by it to rest from his long walk. His disciples went on to the city to buy food, leaving him there alone. These words aroused the interest of the woman at once. Who could this stranger be she wondered. She knew he was not like other Jews, for they would rather suffer from thirst than ask a favor of a Samaritan. Are you are a prophet?” she asked. ”I am that Messiah,” answered Jesus, and the woman looked in joy and wonder upon him. 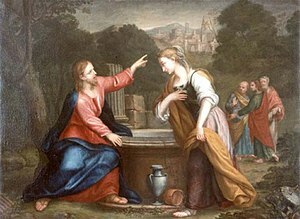 But at that moment the disciples returned from the city bringing food to eat, so she turned away and leaving her water-jug, ran back to tell her friends about the wonderful stranger whom she had met at the well. Then the disciples wondered why Jesus would talk with a despised woman of the Samaritans; but they did not ask him any questions. They brought food to him, and when he refused to eat they urged him. The hot wind blew from the south onto the hillside from the distance barren desert a place where only nomads lived tending their goats. On this lonely hill where packs of wild dogs roamed and lived and ate garage dumped by the local citizens from the city of Jerusalem. It was not a safe place for honest person to be at day or night. The day was unusually warm without a cloud in the sky as the Sun beat upon the dry ground. Suddenly a man appeared carrying a heavy wooden timber across his beaten shoulders. Sweat and blood covered his face as he carried his heavy burden; each step was painful as he walked to the top of the hill. Soldiers from the empire carrying spears guided him forcefully, these unruly soldiers joked and laughed among themselves as they watched the man painful carrying his burden. A crowd of local folk had gathered to watch and follow this man who had only days before had been welcomed him now swore obscenities at him. The hill was barren and not even a blade of grass grew. The donkey that had carried him into the gates of Jerusalem followed the crowd of onlookers. This was God’s Promise Land as promise by His Word to Moses so long ago. As the blood and sweat poured from the beaten man then he painful reached the top of the hill to find more unbelievable pain and suffering. The unruly soldiers still joking and laughing among themselves as they stripped the man of his robe and clothing and then without pause relieved him of his timber he had carried to this appointed place. The onlookers could then see he had been beaten and wrapped on his body. His right eye was missing and had pulled out of its socket. A crown of thorns had been placed on his head by the laughing guards a few hours before. They joked and the one said, “So this is the King of the Jews?” All laughed at his joke as the honest man lay in the dust and grimy hill. With a rush as if they had better things to do they nailed him to the rough cross. Slowly and painful the cross was raised to spot that had been marked. The honest man nailed to the cross was suffering with pain for every breath he took. His lungs now filled with blood making it almost hard to catch a breath of air. He cried out for water to drink but none was offered. He cried out to the heaven above and asked, “Why Father? Why Father in heaven?” No answer was given, no bolt of lighting flashed across the sky. Nothing but only silent. No answer came. The two other hard looking men were nailed to their own crosses, one swore at the honest man while other man told his acquaintance to shut up. Three guards began playing with dice and gamble over the honest man’s robe. Two women cried and prayed at the foot of the innocent man while a crowd of lookers grew the devil Satan full envy hid in the growing crowd. The donkey was restless by now. Someone in the crowd picked up a stone to throw at the innocent man but he was stopped by a big fellow standing next to him. Dark clouds gathered above in the sky as if a storm was about to come. The day was not to be peaceful. No shouts of Hosanna. No one was acclaiming him as they did a week earlier. And then the innocent man He was the Son of God died. Upon his death the earth shook with a tremble and earth itself split open with a mighty bust of power which was felt everyone on the hill. The donkey that had carried Jesus became wild with fear as the earth shook. The guard who had beat and whipped the Son of God swore at the donkey, with a mighty kick he kicked the impatience guard in the leg. The impatience guard turned to get away from the wild animal was kicked once again in his other leg. The guard limped off to be crippled rest of his days. Another guard thrust his spear into the side of Jesus. The sky became dark as the storm clouds gather. The crowd of onlookers including the devil the fallen Angel hurriedly left the hill and scene of the death the innocent man called Jesus. Many found their homes destroyed from the quaking earth. The guards returned to their cheap wine with memories what had happened. In three days the innocent man called Jesus raised from His tomb. He is alive! The movement you need is on your shoulder…. The Dad responds, “Yes, she is a girl. This is a summary of the annual report ofthe PACE . with class and race whether a group of people are called “immigrants” or not. I enjoyed this section…If we could all just think as Jesus!